b) Note that GaAs positions can change significantly with dopants. c) Vacuum fractured standard sample taken in this laboratory. As 3d5/2 - As 3d3/2 splitting value is 0.68 eV +/- 0.03 eV (based on 9 literature references). 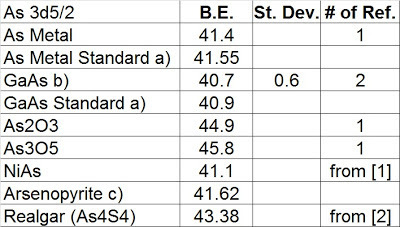 Standard As metal gave a splitting value of 0.70 eV and a standard GaAs gave a value of 0.71 eV. FWHMs for As metal were 0.55 eV and 0.75 eV at 10 eV and 20 eV pass energies. FWHM for GaAs metal was 0.79 eV at 20 eV pass energy. FWHM for arsenopyrite was 0.58 eV at 10 eV pass energy. 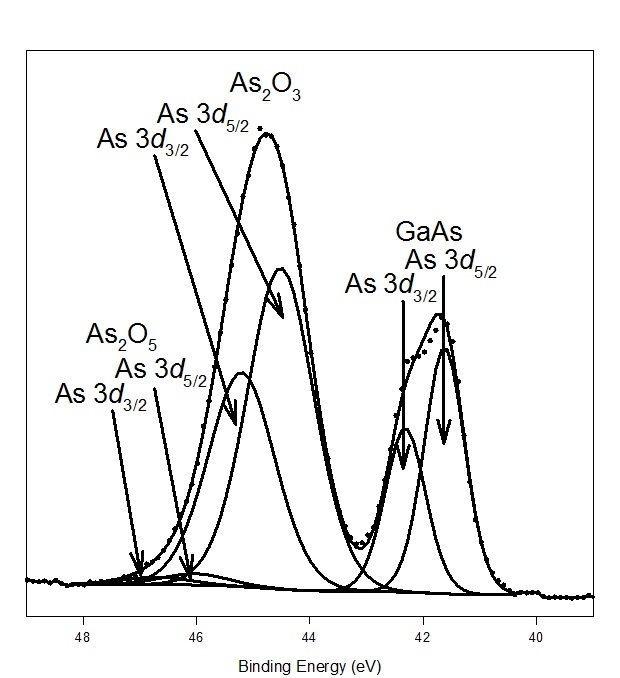 The oxides had FWHM of 0.97-1.4 eV (20 eV pass energy). In the fitting process we generally set the oxide peaks to have equivalent FWHM. Figure 1. As 3d fitting of an oxidized GaAs surface. Table 2. As 2p3/2 binding energies. 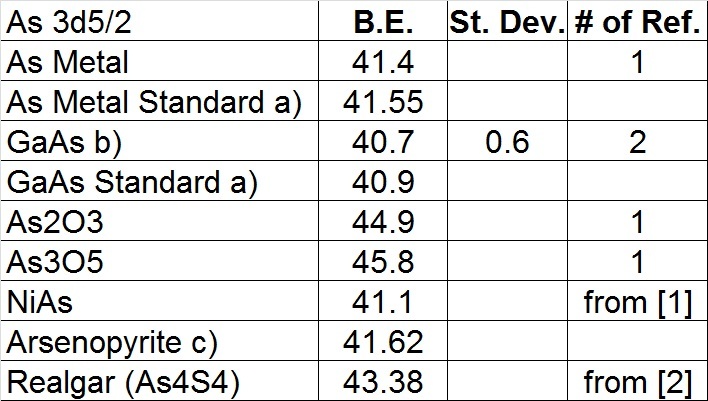 From standard samples and [3,5]. a) Argon ion sputter cleaned standard samples taken in this laboratory . Some good examples of fitting As spectra using the above data are found in references [4, 5 and 6]. H.W. Nesbitt and M. Reinke, American Mineralogist, 84 (1999) 629. A.R. Pratt, H.W. Nesbitt, American Mineralogist, 85 (2000) 619.